Bertolt Brecht (; German: ( ); born ; 10 February 1898 – 14 August 1956) was a German Marxist poet, playwright, and theatre director. Bertolt Brecht was born in February 1898 in epic theatre. When he was 16, the First World War broke out. Initially enthusiastic, Brecht soon changed his mind on seeing his classmates "swallowed by the army". On his father's recommendation, Brecht sought a loophole by registering for an additional medical course at Munich University, where he enrolled in 1917. There he studied drama with Arthur Kutscher, who inspired in the young Brecht an admiration for the iconoclastic dramatist and cabaret-star Frank Wedekind. In July 1919, Brecht and Paula Banholzer (de) (who had begun a relationship in 1917) had a son, Frank. In 1920 Brecht's mother died. 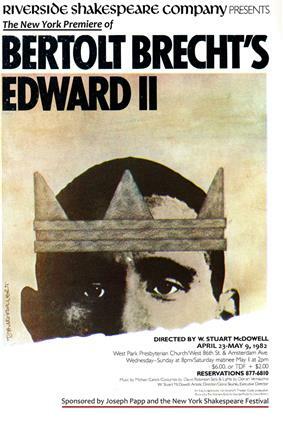 Poster for the Riverside Shakespeare Company's production of Brecht and Lion Feuchtwanger's Edward II. New York City, 1982. "[Brecht's] language is vivid without being deliberately poetic, symbolical without being over literary. Brecht is a dramatist because his language is felt physically and in the round." In 1926 a series of short stories was published under Brecht's name, though Hauptmann was closely associated with writing them. 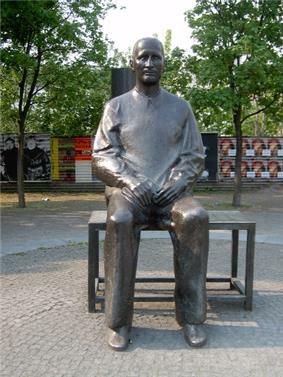 Following the production of Man Equals Man in Darmstadt that year, Brecht began studying Marxism and socialism in earnest, under the supervision of Hauptmann. "When I read Marx's Capital", a note by Brecht reveals, "I understood my plays." Marx was, it continues, "the only spectator for my plays I'd ever come across." 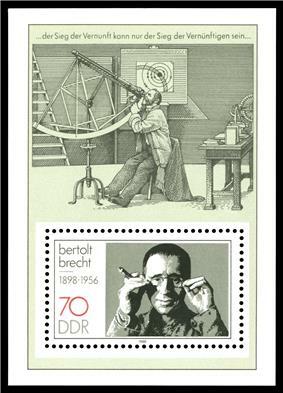 Stamp from the former East Germany depicting Brecht and a scene from his Life of Galileo. Brecht formed a writing collective which became prolific and very influential. Saint Joan of the Stockyards, which attempts to portray the drama in financial transactions. Brecht spent the last years of the Weimar-era (1930–1933) in Berlin working with his "collective" on the Lehrstücke. These were a group of plays driven by morals, music and Brecht's budding epic theatre. The Lehrstücke often aimed at educating workers on Socialist issues. The Measures Taken (Die Massnahme) was scored by Hanns Eisler. In addition, Brecht worked on a script for a semi-documentary feature film about the human impact of mass unemployment, Kuhle Wampe (1932), which was directed by Slatan Dudow. This striking film is notable for its subversive humour, outstanding cinematography by Günther Krampf, and Hanns Eisler's dynamic musical contribution. It still provides a vivid insight into Berlin during the last years of the Weimar Republic. The so-called "Westend Berlin Scene" in the 1930 was an important influencing factor on Brecht, playing in a milieu around Ulmenallee in Westend with artists like Richard Strauss, Marlene Dietrich and Herbert Ihering. By February 1933, Brecht’s work was eclipsed by the rise of Nazi rule in Germany. Fearing persecution, Brecht left Funen. This became the residence of the Brecht family for the next six years, where they often received guests including Walter Benjamin, Hanns Eisler and Ruth Berlau. During this period Brecht also travelled frequently to Copenhagen, Paris, Moscow, New York and London for various projects and collaborations. When war seemed imminent in April 1939, he moved to Stockholm, Sweden, where he remained for a year. Then Hitler invaded Norway and Denmark, and Brecht was forced to leave Sweden for Helsinki in Finland, where he waited for his visa for the United States until 3 May 1941. Brecht also wrote the screenplay for the Fritz Lang-directed film Hangmen Also Die! which was loosely based on the 1942 assassination of Reinhard Heydrich, the Nazi Reich Protector of German-occupied Prague, number-two man in the SS, and a chief architect of the Holocaust, who was known as "The Hangman of Prague." Hanns Eisler was nominated for an Academy Award for his musical score. 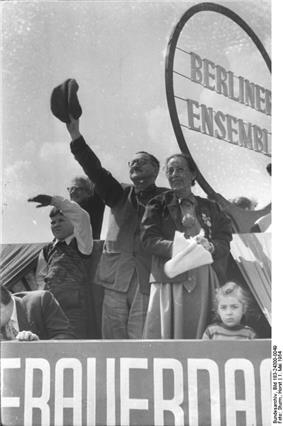 The collaboration of three prominent refugees from Nazi Germany – Lang, Brecht and Eisler – is an example of the influence this generation of German exiles had on American culture. Brecht and Weigel on the roof of the Berliner Ensemble during the International Workers' Day demonstrations in 1954. 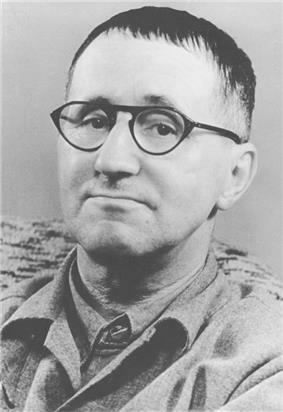 In the years of the Cold War and "Red Scare", Brecht was blacklisted by movie studio bosses and interrogated by the House Un-American Activities Committee. Along with about 41 other Hollywood writers, directors, actors and producers, he was subpoenaed to appear before the HUAC in September 1947. Although he was one of 19 witnesses who declared that they would refuse to appear, Brecht eventually decided to testify. He later explained that he had followed the advice of attorneys and had not wanted to delay a planned trip to Europe. Dressed in overalls and smoking an acrid cigar that made some of the committee members feel slightly ill, on 30 October 1947 Brecht testified that he had never been a member of the Communist Party. He made wry jokes throughout the proceedings, punctuating his inability to speak English well with continuous references to the translators present, who transformed his German statements into English ones unintelligible to himself. HUAC Vice Chairman Karl Mundt thanked Brecht for his co-operation. The remaining witnesses, the so-called Hollywood Ten, refused to testify and were cited for contempt. Brecht's decision to appear before the committee led to criticism, including accusations of betrayal. The day after his testimony, on 31 October, Brecht returned to Europe. Though he was never a member of the Communist Party, Brecht had been deeply schooled in Marxism by the dissident communist Karl Korsch. 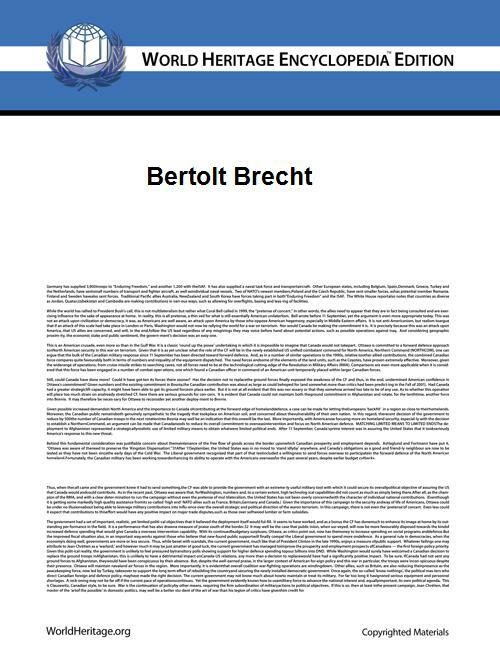 Korsch's version of the Marxist dialectic influenced Brecht greatly, both his aesthetic theory and theatrical practice. Brecht received the Stalin Peace Prize in 1954. Brecht wrote very few plays in his final years in East Berlin, none of them as famous as his previous works. He dedicated himself to directing plays and developing the talents of the next generation of young directors and dramaturgs, such as Manfred Wekwerth, Benno Besson and Carl Weber. Some of his most famous poems, including the "Buckow Elegies", were written at this time. 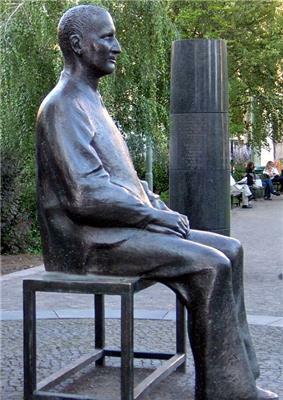 Statue of Brecht outside the Berliner Ensemble's theatre in Berlin. One of Brecht's most important principles was what he called the Verfremdungseffekt (translated as "defamiliarization effect", "distancing effect", or "estrangement effect", and often mistranslated as "alienation effect"). This involved, Brecht wrote, "stripping the event of its self-evident, familiar, obvious quality and creating a sense of astonishment and curiosity about them". To this end, Brecht employed techniques such as the actor's direct address to the audience, harsh and bright stage lighting, the use of songs to interrupt the action, explanatory placards, and, in rehearsals, the transposition of text to the third person or past tense, and speaking the stage directions out loud. 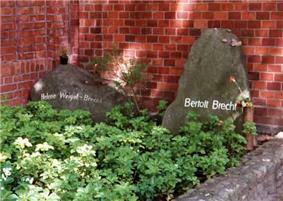 Brecht's widow, the actress Helene Weigel, continued to manage the Berliner Ensemble until her death in 1971. Perhaps the most famous German touring theatre of the postwar era, it was primarily devoted to performing Brecht's plays. Dramatists and directors in whom one may trace a clear Brechtian legacy include: Dario Fo, Augusto Boal, Joan Littlewood, Peter Brook, Máiréad Ní Ghráda, Peter Weiss, Heiner Müller, Pina Bausch, Tony Kushner, Robert Bolt and Caryl Churchill. Brecht's influence may also be detected in the films of Jean-Luc Godard, Lindsay Anderson, Rainer Werner Fassbinder, Joseph Losey, Nagisa Oshima, Ritwik Ghatak, Lars von Trier, Hal Hartley, and Jan Bucquoy. Brecht has been a controversial figure in Germany, and in his native city of Augsburg there were objections to creating a birthplace museum. By the 1970s, however, Brecht's plays had surpassed Shakespeare's in the number of annual performances in Germany. In the 2006 film The Lives of Others, a Stasi agent played by Ulrich Mühe is partially inspired to save a playwright he has been spying on by reading a book of Brecht poetry that he had stolen from the artist's apartment. In particular, the poem "Reminiscence of Marie A.") is read. ^ Thomson (1994, 24). In his Büchner and Valentin, as his "chief influences" in his early years: "he," Brecht writes of himself in the third person, "also saw the writer Wedekind performing his own works in a style which he had developed in cabaret. Wedekind had worked as a ballad singer; he accompanied himself on the lute." (1965, 69). Kutscher was "bitterly critical" of Brecht's own early dramatic writings (Willet and Manheim 1970, vii). ^ See Brecht's Journal entry for 24 June 1943. Brecht claimed to have written the adaptation (in his Journal entry), but Piscator contested that; the manuscript bears the names "Brecht, [Felix] Gasbarra, G. Grosz" in Brecht's handwriting (Willett 1978, 110). See also Willett (1978, 90–95). Brecht wrote a sequel to the novel in 1943, Schweik in the Second World War. ^ Willett (1998, 104). In relation to his innovations in the use of theatre technology, Piscator wrote: "technical innovations were never an end in themselves for me. Any means I have used or am currently in the process of using were designed to elevate the events on the stage onto a historical plane and not just to enlarge the technical range of the stage machinery. This elevation, which was inextricably bound up with the use of Marxist dialectics in the theatre, had not been achieved by the plays themselves. My technical devices had been developed to cover up the deficiencies of the dramatists' products" ("Basic Principles of a Sociological Drama" ; in Kolocotroni, Goldman and Taxidou [1998, 243]). ^ The two first met in March 1927, after Weill had written a critical introduction to the broadcast on Berlin Radio of an adaptation of Brecht's Expressionist playwrights that Brecht admired; he was married to the actress Lotte Lenya. Willett and Manheim (1979, xv). ^ "Barbara Brecht-Schall – About This Person". ^ Parker S. (Apr 2, 2011). "Diagnosing Bertolt Brecht.". Lancet. 377 (9772): 1146–7. ^ On these relationships, see "autonomization" in Jameson (1998, 43–58) and "non-organic work of art" in Bürger (1984, 87–92). Willett observes: "With Brecht the same montage technique spread to the drama, where the old Procrustean plot yielded to a more "epic" form of narrative better able to cope with wide-ranging modern socio-economic themes. That, at least, was how Brecht theoretically justified his choice of form, and from about 1929 on he began to interpret its penchant for "contradictions", much as had Eisenstein, in terms of the dialectic. It is fairly clear that in Brecht's case the practice came before the theory, for his actual composition of a play, with its switching around of scenes and characters, even the physical cutting up and sticking together of the typescript, shows that montage was the structural technique most natural to him. Like Hašek and Joyce he had not learnt this scissors-and-paste method from the Soviet cinema but picked it out of the air" (1978, 110). ^ Hsia, Adrian ([northern] Summer 1983). "Bertolt Brecht in China and His Impact on Chinese Drama". ^ On Jan Bucquoy, see Jan Bucquoy, La vie est belge; Le paradis, là, maintenant, tout de suite!, (2007), p. 98: "Sans illusion car j'avoue que mon but dans la vie c'était de monter Mère Courage de Berthold Brecht au théâtre de l'Odéon à Paris. Au lieu de ça ce sont les escaliers du Dolle Mol que j'ai plutôt bien descendus. C'est le destin." English translation: "It was my destiny that I never would bring Mother Courage and Her Children to the Odéon Theatre in Paris." ^ Ritwik Ghatak first translated Brecht into Bengali, before then making use of some of his key theories in the later films Cloud-Capped Star and Subarna-Rekha. See Banglapedia: Film, Feature. Retrieved 27 July 2006. ^ Jameson (1998, 10–11). See also the discussions of Brecht's collaborative relationships in the essays collected in Thomson and Sacks (1994). John Fuegi's take on Brecht's collaborations, detailed in Brecht & Co. (New York: Grove, 1994; also known as The Life and Lies of Bertolt Brecht) and summarized in his contribution to Thomson and Sacks (1994, 104–116), offers a particularly negative perspective; Jameson comments "his book will remain a fundamental document for future students of the ideological confusions of Western intellectuals during the immediate post-Cold War years" (1998, 31); Olga Taxidou offers a critical account of Fuegi's project from a feminist perspective in "Crude Thinking: John Fuegi and Recent Brecht Criticism" in New Theatre Quarterly XI.44 (Nov. 1995), p. 381–384. Davies, Steffan; Ernest Schonfield (2009). Davies, Steffan and Schonfield, Ernest, ed. Alfred Döblin: Paradigms of Modernism. Berlin and New York: Walter de Gruyter.